2018 Castle Dark: This year's theme is The Lady in White. Attractions include the Ghost Manor free-roaming virtual reality experience, the Shiverton maze, and the Ghost Blasters shooter game. 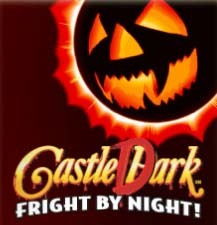 During October, the normally family-friendly Castle Park transforms into Castle Dark on weekends. When the sun goes down, the terror arrives, courtesy of mazes, monsters, and revamped rides. Castle Dark is recommended only for children 13 and over. Castle Park also presents Happy Hauntings on Saturday and Sunday afternoons in October. Park opens at noon; Halloween activities run 3-5pm, including costume contests, pumpkin carving, a House of Halloween maze, and interactive trick-or-treating for kids 12 and under. Included with regular admission.